The Reds skipper admits that he has been inhibited by opponents at times this season but believes that his performance against Everton proves that he still has plenty to offer. 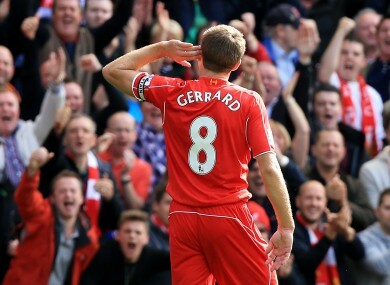 Liverpool's Steven Gerrard celebrates scoring his side's goal during the Merseyside Derby. LIVERPOOL CAPTAIN STEVEN Gerrard has hit back at his critics, insisting that he is far from past it after his side’s 1-1 draw with Everton. The 34-year-old has been criticised for his performances this season as the Reds have struggled with just two wins in six Premier League games. Gerrard had appeared to put his side on track with a fine free kick in the 65th minute of Saturday’s Merseyside derby, only for Phil Jagielka to equalise with a stunning half-volley at the death, and, after one of his better showings this season, the Liverpool skipper said that those who had written him off had spoken too soon. “I’ll agree with the constructive criticism and I’ve been stifled in a couple of games when people have followed me around and I haven’t been able to shake them off,” he told the press. “But then some people take it too far and say ‘he’s 34, he can’t run and he’s finished’. Email “I'm not finished yet - Steven Gerrard”. Feedback on “I'm not finished yet - Steven Gerrard”.